The DELTADIATONICS method is an expanded approach of our diatonic harmonic system. It provides a new succinct system that simplifies our current harmonic practices. The many one page handouts will give your students a fresh approach to traditional material and provide additional insight to help them really learn the subject. See the Deltadiatonic Index for complete list of topics. The Flash drive book contains over 60 documents and is available for $25.00 go to contacts to order. Below you will find some free music theory downloads using DELTADIATONICS. The four foundational triads, major, minor, augmented and diminished are each assigned a unique quality symbol which then transform themselves into the seven chords of the seventh qualities found in our diatonic major and minor harmonic system. Open the PDF's, The DELTADIATONIC Synopsis along with The Potent Dominant for your FREE 25 page book that will take you through a complete understanding of triadic, chords of the seventh, quartal and advanced upper structure harmony, all using the DELTADIATONIC method. 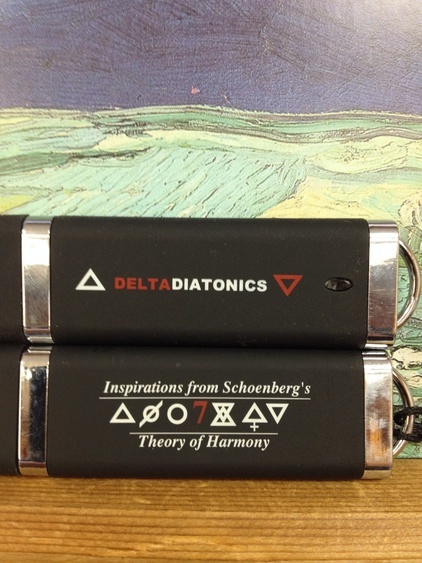 Deltadiatonics Inspirations from Schoenberg's Theory of Harmony on an engraved flash drive.